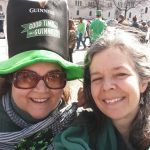 An afternoon of Irish fun! Audra, Claudia & Tara shared the "luck of the Irish" with our IMMA girls by taking them to the Munich St. Patrick's Day parade on Sunday, March 17. With gorgeous weather and great company many of the girls and social workers experienced their first taste of St. Patrick's Day. Just like the weather some of the girls had to warm up to the idea, but once the parade started and they received their flags, they were the loudest and happiest onlookers at the parade. As a treat the girl who was the nicest got Tara's very much sought after hat as her reward. We are looking for more members who want to actively participate with the girls. Please feel free to contact Tara for more info. Looking for AAUPW Member to be liasion to IMMA starting second half of 2019. Please let me know if you are interested.